Samurai Battles – the new game from Zvezda, is just about to reach the UK. I’ve been eargerly anticipating this game ever since it was first announced earlier in the year. 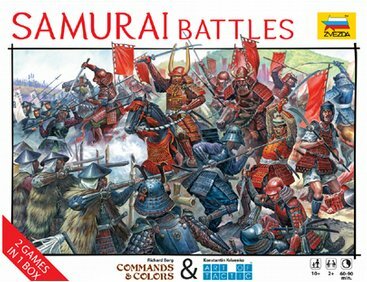 The combination of Commands & Colours rules with the Samurai period is one of those ‘perfect storms’ for me. The game was on display at Origins game fair, and there is a video interview with co-designers Richard Borg and Konstantin Krivenko on BoardGameGeek. It’s near the bottom of the list of videos. There is an offical website for the game, which will hopefully feature more news and possible downloads for the game. There is a forum, but unfortuantely for Brits it appears to be in Russian. t is worth noting that the models for this game have been redesigned by Zvezda, and so their older range of plastic 1/72 scale Samurai do not appear to be fully compatible with this game – certainly the bases are different -I believe that the new figures are cast in hard plastic. Also, the unit sizes for Commands & Colours & Art of Tactics appear to be different, so you may need to double-up on Cavalry if ordering expansion boxes for the game. That must be very disappointing for people who have some figures that the new ones may not be compatible….maybe they will not be spot on but be close enough to “do”? Even with 20mm plastic the price can still add up, from the little I know it strikes me this is a “big battle/lots of troops” field. The figures are almost compatible with their previous box sets – the difference is in the plastic quality (now using a harder plastic) and the bases (They have changed the bases to work with the C&C banners) I’ll have a look when the games arrives (now Monday) and see what I think. re using older figures, simply paint the banners the correct colour and add a circle, square or triangle and dont bother with the official unit bases? ?